I'm kind of ashamed to admit this but I only discovered recently that the developer of Super Hexagon is the same Terry Cavanagh that developed VVVVVV; VVVVVV is a retro, minimalist platformer with an awesome soundtrack that was originally released as a Flash game in 2010, although the game was ported to C++ in 2011. The game has won several awards and is critically acclaimed; I think it helped spearhead the indie game renaissance on PC after the success of games like Minecraft in 2009. Anyway, Cavanagh developed another retro, minimalist game with an awesome soundtrack in 2012 and that's the game I'm reviewing now: Super Hexagon. It too received awards and critical acclaim: it currently holds a Metascore of 88 on Metacritic and 97% of the 14,531 user reviews on Steam are positive, giving it an "Overwhelmingly Positive" Steam rating. But what do you actually do in Super Hexagon? Well, you avoid polygons. And that's all there is to it. 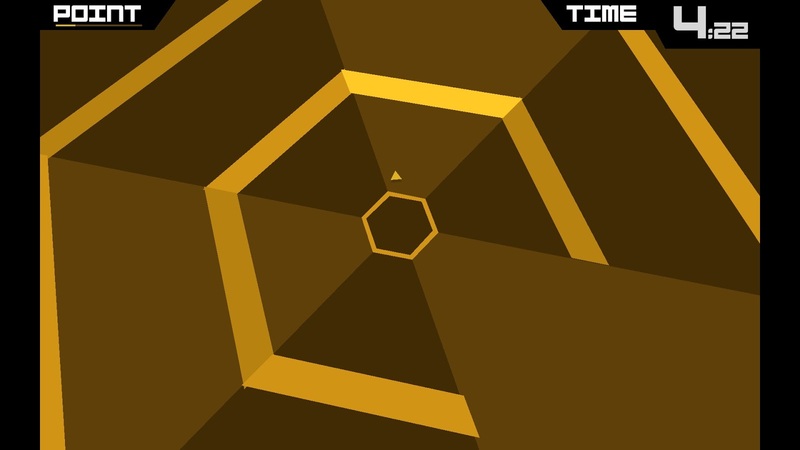 In the first level you'll come across walls that head towards the centre of the screen where your triangle resides. You have to move the triangle around the centre of the screen to avoid the incoming walls. Sometimes there's plenty of space but other times you'll come across hexagons with an edge missing (meaning that a collision with five out of the six edges will spell "GAME OVER"). If your triangle collides into a wall, you have to start again, but the game will continue to record your personal best time (i.e. the number of seconds you've survived dodging polygons). I bought a 2-pack of the game back in 2013 (it was 90% off) so I got it for 50 Cent and I got it on Christmas too ("JC! It's your birthday! We gon' party like it's yo birthday!"). I'm still not sure why exactly I got the game but I suspect it's something to do with the game being so well received by critics and Steam users alike. Niamh Houston aka Chipzel (I first encountered her music in Interstellaria) is known for her great chiptune soundtracks, and her soundtrack for Super Hexagon is no exception. She sells the EP on Bandcamp if you're willing to pay a couple of quid. One of the great aspects of this game is that the graphics pulsate in time with the music, so it's almost like a rhythm game too. Left and right. Those are the only two controls you need to know in order to play this game. Games usually only take a few seconds to complete (especially if you're as bad as me) and since they're so short, you won't feel bad trying it a few more times to see if you can beat your best time; it's addictive in an old-school way, you're always striving to beat your personal best. There are 6 Steam Achievements to earn (which are related to completing the stages) and the game is integrated with Steam Leaderboards; this means you can compare your best times with your friends and the Steam community from inside the game. It took me over half an hour of tries before I finally made my way out of the easiest level of the game (where you have to survive a grand total of 20 measly seconds). So it's definitely not a game for the uncoordinated; you've got to have good reflexes and you've got to pray to God you don't move the triangle too far left or right or else you'll accidentally direct it on a collision course with the nearest wall. Also, while it's understandable that there's no point in progressing to the harder difficulty levels if you can't even complete the first level, it also means you're locked out from the rest of the game's content potentially forever (if you're as bad at the game as me). 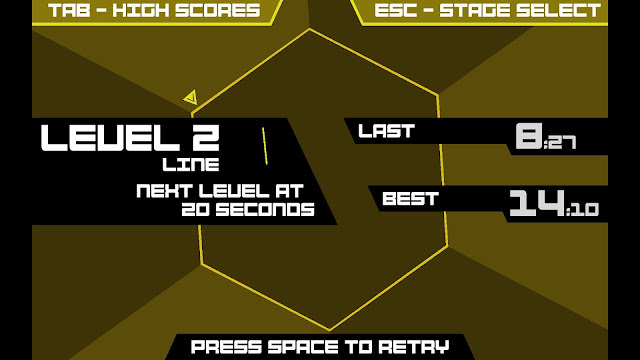 If you're looking for a challenging minimalist arcade game with a fantastic chiptune soundtrack to boot, Super Hexagon is worth a look. If you're as bad as me at games like these though, the game can seem like a bit of a waste since you might be forever stuck on the first level. Is the game worth $4.50 AUD? : There really isn't much to this game but yes, I think it's worth the money as it's got quite a bit of replay value if you're into these sorts of games.